Update: I went to Target and I was able to pricematch to Staples.com. They were not sure whether they were allowed to do it, but they said only 1 pricematch item so it won't be the most lucrative trip even if you get the match. I then asked to apply the cartwheel coupon which they were happy to do. I used my RedCard and earned another 5% off. Final price was slightly under $400. I should earn $100-$120 for the one iPad. Not too shabby but I don't think I would go back just for another iPad. Too easy for you to come away with nothing. YMMV. If was going to Target anyways, I would buy an iPad while I was there. You may go and they may not have them in stock, they many not pricematch for you, they many not allow you to use the cartwheel savings after the pricematch. I published a deal this morning for a nice deal on staples.com. There is a way to make this even sweeter at Target. 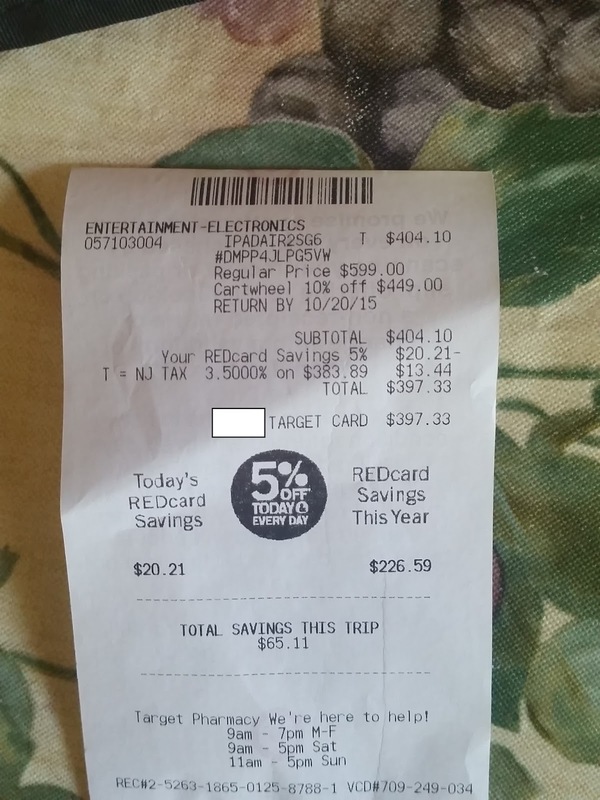 Target should pricematch to Staples. Target is also offering 10% off iPads on their Cartwheel App (expires 9/26) with a maximum of 4 per transaction though they may not let you buy that many. Limit of using the coupon 6 times per day so you could technically buy 24 but you will probably have to go to different Target stores to get that done. I don't know if they will price match and then apply the coupon, but if they will, you can also get the 5% RedCard discount. You also don't need to do one or the other, you can do both.